California Living ® host Aprilanne Hurley invites you to discover Angel Island’s Quarry Beach in the middle of San Francisco Bay. 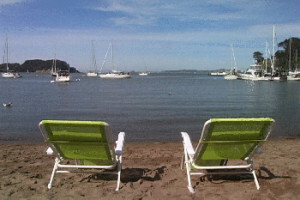 California Living ® TV host Aprilanne Hurley delivers an Insider’s Guide to Angel Island’s “secret beaches” this season. When the heat is on, escape the beach traffic and crowds – just head to Tiburon, California, for an Angel Island Ferry to Angel Island State Park. There you’ll discover a paradise island complete with “secret” white sandy beaches boasting million dollar views in the middle of San Francisco Bay. The easiest and quickest way to visit Angel Island State Park is catching the Angel Island -Tiburon Ferry out of picturesque Tiburon, California, a romantic Bay Area getaway recently featured on California Living ® as a close to home escape. California Living® invites you to Sip & Savor Spectacular Sunsets on San Francisco Bay with Angel Island Ferry. Check out Angel Island Ferry’s Exclusive Father’s Day Gift Package to include a Bonus Sunset Cruise to the Golden Gate Bridge for 2 people. Click here for info. on $4.00 & $5.00 ALL DAY Parking in Tiburon, California. With its wide variety of outdoor activities and a number of historic sites to explore, such as the “U.S Immigration Station“, Angel Island State Park is a great local getaway offering a few “secret” beaches with priceless views of the San Francisco skyline and the Golden Gate Bridge across the San Francisco Bay. While you can pre-arrange to camp on the island, day-tripping to Angel Island State Park makes an ideal Bay Area getaway. The Tiburon ferry schedule changes seasonally, with the most frequent service offered early spring through mid-October – so it’s best to check the Angel Island Tiburon Ferry schedule ahead of time to plan your trip. 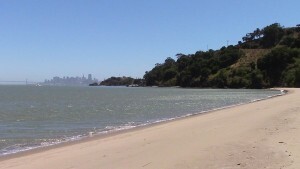 California Living ® host Aprilanne Hurley invites you to discover Angel Island’s Perles Beach. Find your own paradise island in the middle of San Francisco Bay with a visit to Perles Beach, which is located on the east side of Angel Island Start Park and accessed via a short walk down from Ft. McDowell, also known as East Garrison. In addition to its million dollar views of the East Bay and the San Francisco skyline, you’ll find those sandy beaches you’ve been dreaming of. Stop by the Visitor’s Center located in Ayala Cove to pick up a map of Angel Island and other informational handouts to make the most of your day on Angel Island State Park. You may also like to check out Angel Island’s “Angel Cam” for a (nearly live) look at the weather conditions on the island. View a detailed, printable map of Angel Island State Park on AngelIsland.org. Dress in layers as the weather can change from comfortably warm or cool – to very cold at any point during the day. Bring extra water bottles, snacks, and some spending money for food and souvenirs. Pack a healthy picnic, or pick up a delicious sandwich, boxed lunch or fresh, gourmet salad at The Angel Island Cafe located at Ayala Cove. 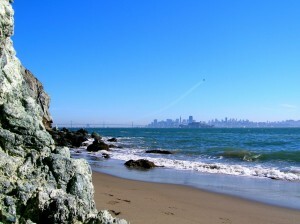 Ready for some adventure with your Angel Island beach day? Picture yourself here…California Living ® invites you to experience Ayala Cove on Angel Island. For those with little ones to look after, Ayala Cove is the most accessible beach for children, which is located right near the public ferry entry dock. Ayala Cove offers a public picnic area with free charcoal grills (Bring your own charcoal), and a fun and easygoing environment for kids of all ages. Ayala Cove is also close to everything including the public rest rooms, a cafe, and the Visitors Center. Directions to Angel Island Tiburon Ferry Dock and Tiburon Ferry parking information. 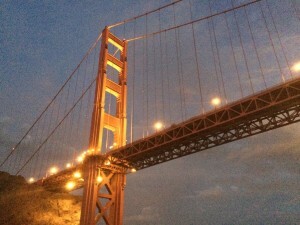 #bay area getaways, Angel Island, Angel Island Beaches, Angel Island Ferry, California, California Life, California Living, father's day, father's day getaways, Tiburon, U.S Immigration Station. Bookmark.